First, let’s dive into the prospect research advice. Find major gift prospects and properly steward them. Identify candidates for any volunteer programs. See who might be a good monthly donor. Segment the donors for more customized future outreach. Of course, that’s only a short list of the many benefits you’ll get from screening. In summation: Prospect research will allow you to segment and organize all your new donor data into actionable categories. 2. Check on their matching gift eligibility. A matching gift is a donation given by a donor’s employer that “matches” the original contribution, usually at a 1:1 ratio. As we’ve explained previously, “Matching gifts are a type of corporate giving program that essentially double an employee’s initial donation to an eligible nonprofit organization…With matching gifts, your donors are able to give to your organization twice with only incurring the cost of the initial contribution.” Chances are, a good portion of your new donors’ gifts are match eligible. If you don’t have a built-in matching gift reminder in your donation process, you should consider doing some sort of matching gift follow-up. For example, you can send all new donors an email that explains the matching gift potential and process. When they hear that they can increase their gift to your cause at no cost to their own bank account, they’re going to be inclined to take that opportunity. 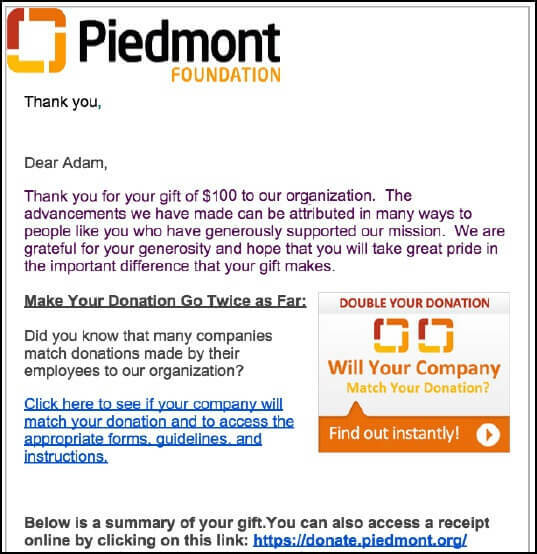 Here’s an example of a well-executed follow-up email and acknowledgment: In summation: Like the example above, you too can promote matching gifts and make your sudden surge in donations even bigger. 3. Incorporate them into your communications. Arguably, the most important action you can take with your new donors is incorporating them into your communication streams. Even if you don’t have the time or capacity to do more than that, you should ensure that all new donors are receiving your newsletter, standard direct mail, and any other customary communications. Always remember to send a welcome email so that they know much how much their initial gift was appreciated. Getting new donors into your communication streams makes sure that your organization stays front of mind and will help you improve your retention rates. To continue our example from the introduction, this hurricane season has been deadly and absolutely devastating. If your nonprofit services the regions affected by Hurricanes Harvey, Irma, Jose, Maria, and now Nate, you’ve likely seen a surge in gifts over the past two months. For example, imagine someone reached out to your organization and gave a gift of $100 in the aftermath of Hurricane Harvey. Now, after seeing Irma, Jose, Maria, and Nate, that same donor is looking to give again. If you properly stewarded that individual following their first gift, you’ll be high on their list for their next gift, and your nonprofit will receive the funding that is crucial to the disaster relief services you’re providing. Repeat giving is a cycle that starts with your stewardship services. If you already have your donor database integrated with your donation pages and your marketing automation, this should be a relatively straight forward (and likely automated) process. If your organization does not have that level of technology, the process is going to require more man power. However, the return on investment for retaining these new donors should make it worth it. In summation: By adding new donors to your communications, you ensure that your organization and your cause stays front-of-mind. 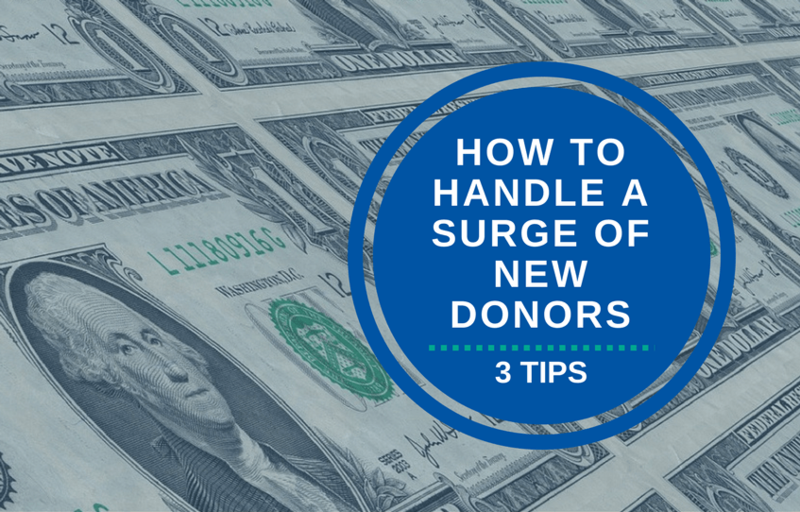 While a surge in donations is always something to celebrate, if you have a plan in place for handling the new donors, you greatly improve your chances of retaining those same donors. Employ the techniques above, alongside your other donor retention strategies, and start building relationships with your new donors.